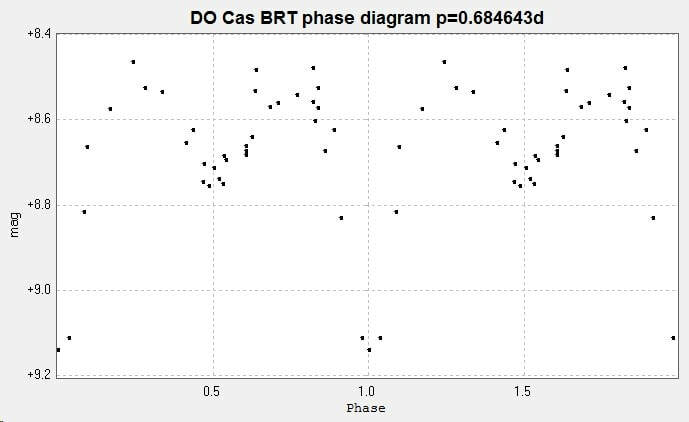 Light curves and phase diagrams of the EB type eclipsing binary DO Cassiopeiae / DO Cas. ​There is a sinusoidal variation evident in its o-c curve which has been attributed to a third body in the system (Kyu-Dong Oh, Chun-Hwey Kim, 1997). 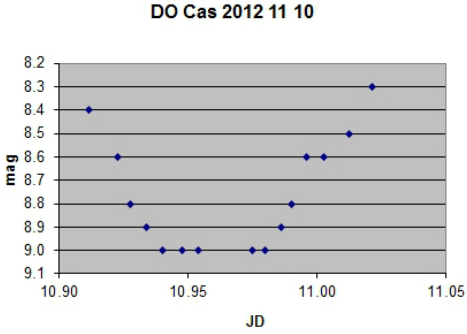 Two primary minima of EB type eclipsing binary DO Cas were obtained with the 2" Titan from Somerby Observatory in November 2013, on the 10th and the 12th. The light curve is below. 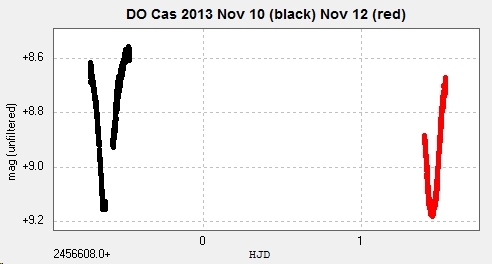 The gap in the Nov 10 run was due to cloud. The period of the system is given as 0.6846667d (Kreiner). A period search (Peranso/ANOVA) is consistent with this, suggesting a best fit period of 0.6850d. Using this period, the following phase diagram was constructed. The following light curve and phase diagram were constructed from 36 images taken with the Cluster Camera of the Bradford Robotic Telescope, using their 'green' filter, between 2014 October 12 and 2016 October 1. The two sets of data above (Bradford Robotic Telescope and Somerby Observatory) were combined to produce the following light curve and phase diagram. ​The same phase diagram as above, but greyscale not colour. 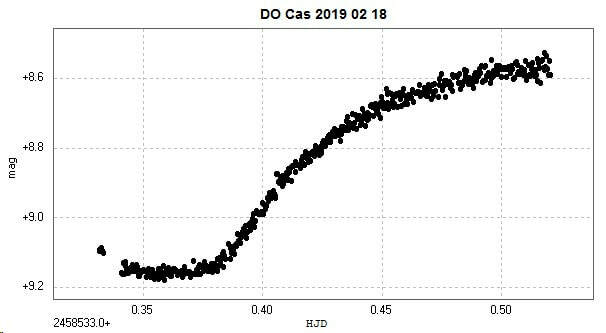 DO Cas observed coming out of primary eclipse on 2019 February 18 with the 2" Titan at Somerby Observatory. ​A minimum on 10 November 2012 was followed visually from Somerby using 10x50 binoculars and is shown below.